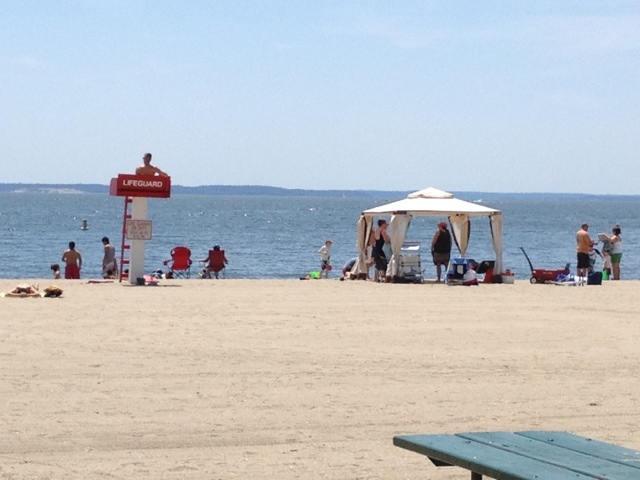 I am only slightly amused by the lifeguard's-view-blocking cabana some family has erected at Cove Island. Or maybe they live there? Looks about the same size as my college dorm room. I'm guessing this is NOT on the "stuff that's ok at Cove" list- essentially, putting up a small house on the beach to block everyone else's view. Ah well, anything goes at Cove. As long as a grown man isn't attacking a child who gets in the way of his roller blading, I probably shouldn't complain. Maybe the lifeguard told them they could use it as long as they keep all the curtains open, and keep it an open structure. I suppose that's fair.